Johnson's Arkansas, Mississippi and Louisiana. 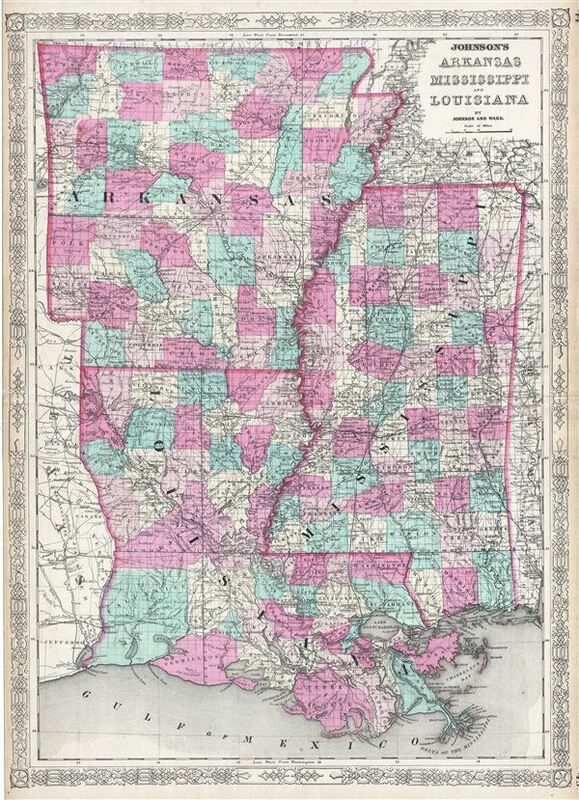 This is a beautiful example of Johnson and Ward's 1865 map of Arkansas, Mississippi and Louisiana. This rare map offers a fascinating snapshot of these secessionist states shortly following the outbreak of the American Civil War. Map shows all three states in full with color coding according to county. Various towns, cities, railways, roads, rivers and several other topographical features are noted with relief shown by hachure. It features the fretwork style border common to Johnson's atlas work from 1864 to 1869. Published by A. J. Johnson and Ward as plate nos. 44 and 45 in the 1865 edition of Johnson's New Illustrated Family Atlas. This is the first edition of the Johnson Atlas to be attributed to Johnson exclusively. Very good. Text on verso. Minor wear along original centerfold. Narrow left and right margins with page numbers cut off. Rumsey 0535.030. Philips (atlases) 4345.